Author Written by Ibn e Rasheed and last updated on Posted on July 9, 2017 . 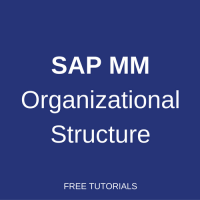 This tutorial is part of SAP MM training course and it explains about SAP MM organizational structures. After following the tutorial, you will learn how to model enterprise structure in SAP MM (Materials Management) module of SAP ERP. Knowledge of SAP MM organizational structure is fundamental for analysts and consultants that specialize in SAP MM and here you will learn about each the MM organizational units. Organization’s structure, be it the reporting structure mentioned in the organizational chart, departmental structure, reporting hierarchy, signing mandate hierarchy, processes and procedurals structure, is mandatory for smooth processing of business processes. Hence, SAP ERP needs to reflect an organizational structure of a company. Every module of SAP has its own enterprise structure. Enterprise structure helps in building a hierarchy and structure to streamline the business processes. Before initiating implementation, designing and configuring the actual system, Enterprise Structure is defined in the Business Blueprint Documentation phase. It is an important step to define the organizational structure. It requires thorough analysis of how an organization currently runs and how the business wants to run the company after implementation of SAP. If an organization is huge, dealing with multiple lines of business, its processes are complex, and it is scattered geographically at different locations, designing and finalizing the Enterprise Structure is a very critical, vital and time taking activity. Several meetings can be called with the Business Process Owners and Subject Matter Experts to finalize the enterprise structure which may also require endorsement and approval from the higher management. Sometimes sign off on SAP enterprise structure is obtained separately during the Business Blueprinting phase. In the SAP ERP, several structures can be used to represent the legal and organizational structure of the company. Organizational elements can be structured from the point of view of accounting, human resources and materials management. It is possible to combine these structures. The organizational structures form a framework in which all business transactions can be processed. The organizational units discussed below are relevant for SAP Material Management (MM) only. From a business viewpoint, the client could represent a corporate group. The client is the highest hierarchical level in the SAP system. A client is considered synonym for a group. Creation of client in SAP is a technical requirement. It is the highest node or the hierarchy of the enterprise or organizational structure in SAP. Several company codes can be maintained within a client. Company code is SAP is the organizational unit which is the created in Finance (FI) module and the same is linked with Materials Management module. Strictly speaking it does not belong to SAP MM organizational structure. Company code represents an independent company. Company which is a legal entity and statutory requirement is to maintain a separate balance sheet. Profit and loss statement are created and maintained at the company code level. In a scenario where the model is that a corporate group or group of companies are carrying out their businesses in different sectors of economy, every company by law is a legal entity which is liable to maintain separate book of accounts. All books of accounts are maintained at the company code level. Plant in the SAP system is a broad term which has a varying definition when different logistics modules come into discussion. In Materials Management (MM) module, a plant is referred to as a facility where the material stock is kept, stored and inventory is maintained. In Production Planning (PP) module, a plant is referred to as a production facility where the production of goods is done. Storage Location is an organizational unit in logistics which is assigned to a plant where the stock is kept and inventory is managed. Storage Location can be characterized and vary based on their properties like Raw Material Storage Location, Finished Goods Storage Location, Spares Storage Location, Returns Sales Storage Location, Temperature Controlled Storage Location, etc. A purchasing organization is responsible for all purchasing activities within a company and is responsible for handling procurement activities and documentation such as RFQ, contracts, purchase orders, etc. In simple words, a Purchasing Organization is an organizational unit in SAP Materials Management which is responsible for purchasing and carries out procurement activities on behalf of the company. Suppose a company has several plants and all the plants have their own procurement department which are responsible to carry out day to day purchasing for their own respective plant. Hence, Purchasing Organizations will be created that will be used separately for each plant. So, this means that a Purchasing Organization can be assigned to a Plant. It is also possible to assign one or more plants to a single Purchasing Organization. If, for example, a company has only one procurement department which is a centralized and carries out procurement activities for all the company. Furthermore, a Purchasing Organization can also be assigned to company code level as well. Similarly, one plant can have several Purchasing Organizations assigned to it as well, this varies from company to company, industry to industry and scenario to scenario. The final unit of SAP MM organizational structure that we need to discuss is Purchasing Group. A Purchasing Group represents an individual or a group of individuals, not necessarily in procurement department, who are responsible of carrying out purchasing activities. This is usually used for reporting purposes, as well as approval procedure (release strategy) for Purchase Requisitions (PR), Requests for Quotation (RFQs), Purchase Orders (PO), Contracts, etc. You can describe a Purchasing Group as a group of purchasers responsible within a purchase organization to procure a specific type of material and/or service. In a procurement department, there are two groups of purchasers. Each group has two members. So, you can authorize each group of purchasers to procure a specific type of material and/or service. Group 1 having Purchasing Group RM1 (Raw Materials) is responsible for procurement of raw materials. Similarly, group 2 having Purchasing Group CN1 (Consumables) is responsible for the procurement of consumable items and so on. Hence, you can assign these groups to the users so that they remain in their assigned Purchasing Groups. Please note that the above examples are just for explanation, scenarios may vary from company to company, industry to industry depending on the business environment. You have menationed 3 groups of purchasers, however, only expleained the functions of 2. What about the 3rd group. Furthermore, you’ve been mentioning 2 members within the groups. What are they and why are they? Could you please also provide some explanation? There was a typo. This example has two groups of purchasers. Members of groups of purchasers are people (purchasing specialists) that are responsible for purchasing activities in a company. what are the job openings in material management when a company is about to go live? 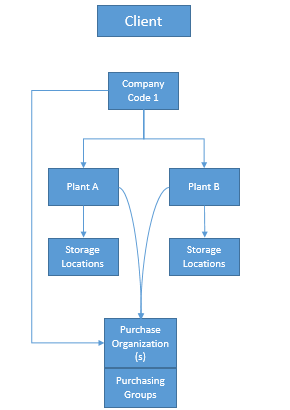 practically how to create company code ,plant,storage location all org units .can u explain ?